Correspondent. 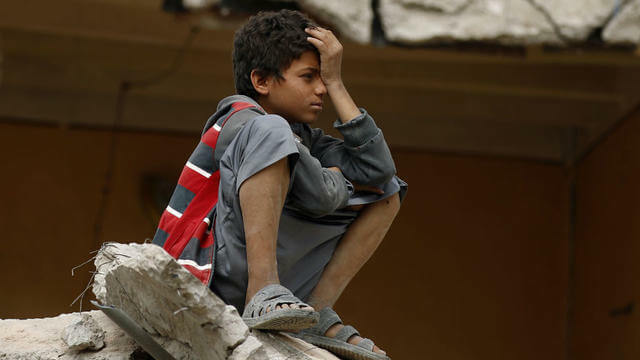 Yemen: children and war On France 2 at 21:00. The magazine of the report presented by Elise Lucet diffuses tonight an excellent document shot in Yemen, prey to the war since 2015. The second part of Special Envoy tonight shines the spotlight on a war that the international community seems to care little about the one that is currently tearing Yemen apart. A conflict that has already killed nearly 9,000 people, more than 3 million displaced, and opposes the separatists of the South to the forces of President Abd Rabbo Mansour Hadi, supported by an Arab coalition led by Saudi Arabia. Since March 2015, it tirelessly pounded the areas held by the rebels, which does not prevent France and other European countries to continue to sell weapons. A real scandal, that effectively denounces this excellent report of Khadija Al-Salami. The filmmaker of Yemeni origin was able to penetrate where journalists no longer have access. It shows a capital, Sanaa, abundant in 2,500 years of history, but now devastated; refugee camps where we miss everything ... Above all, she chooses to tell the war through the eyes of children, especially Youssef and Ahmed, who improvise reporters. Ahmed was first in his class, but now there is no school. And it is to pretend to shoot through the window of his home, with his grandfather's old rifle, that he now occupies his days. As a way of exorcizing anxiety. The two kids take advantage of the director's notebook to document their daily life and offer the people they meet a message to the European Union. To this European Union, whose parliament has passed several resolutions against the sale of arms to Saudi Arabia, without for the moment being followed by effects. They meet a painter using his brush to immortalize the victims of war, as well as a young woman who fights against indifference and forgetfulness by posting photos on social networks. But these are perhaps the words of children themselves who wear the most. One of them cowardly: "I want to live my childhood. Sometimes I feel old already. An exceptional document to discover on France 2, before an upcoming release at the cinema.